I’m sure draining an air compressor of any accumulated water is possibly one of the least-fun maintenance activities out there. 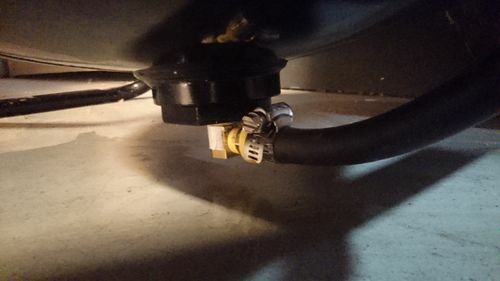 I’m assuming also that most compressors have virtually no room to fit a bucket underneath the drainage port at the bottom of the tank, so you end up having to tilt the unit to drain, which means not all the water gets out. 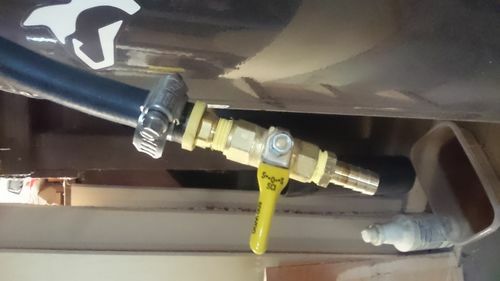 I used a short piece of air hose (4’), a pair of 3/8 barb x 1/4” NPT fittings, a 1/4 NPT x 1/4 NPT close elbow, and a small 1/4” valve, and a couple hose clamps, assembled them, and added this “whip” to the bottom of the compressor, to replace the factory default drainage valve. This took about 20-30 minutes tops. The result is that the air pressure in the tank will force all the water out and through the hose (even “uphill”), and it is now trivial to simply drain the tank into a bucket without rusty water splashing all over the floor. 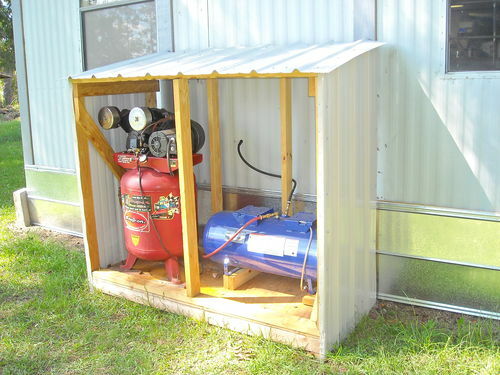 Indeed, the ease of draining the tank now means I will do it more frequently (as I should have been doing all along), which should improve the life of my compressor. Perfect. I was going to copy a friend who used one of the cheap coiled 1/4” air hoses to reach outside his garage and purge into the grass, but this is a neater solution and fits my garage. Cool setup; I simply put a 90 degree street elbow in place of the stock valve on my tank with a 6 inch extension and a gate valve to drain the water out of the tank. Yours definitely gives you more options thought! Thanks. I thought about doing just an elbow and extension, but that still left the issue of how to get the water into a bucket. 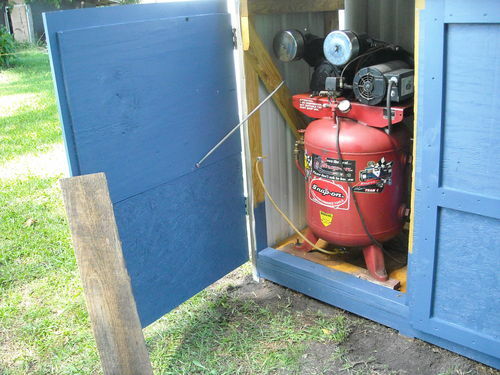 I also at some point plan on adding an electric solenoid valve, connected to a timer, which would automatically vent the water for several seconds, every day, or week depending on need. So having the whip means I can simply add that on later. There is one improvement I’m going to make which is to add a 1ft piece of hosing with some sort of sock on the end to the existing barb. Right now the water rockets out like a firehose and is still quite messy. I did the same basic thing on my dual-tank setup. I clip the drain tubes up to keep bugs from crawling up them and plugging the tubes. 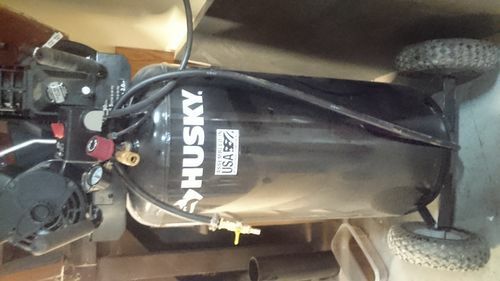 I just finished configuring a used 5hp 60gal upright unit into my small shop and had seen similar ideas online. Decided it was something that I too had to install as part of this config. I’ve always hated the flimsy valves and mini valves the manufacturers put on even the expensive units. They rust or the stamped out wing handles bust off. My hands are not super large, but those valves are PITA. Now that all is in place and plumbed up with a nice reachable ball valve, I will be more inclined to remember and actually drain the tank frequently. I expect this compressor to last me for my duration. This is a neat idea. I was wondering about the power-spray, but your sock idea makes sense. Any concern about having the hose under pressure 24/7? I don’t know anything about compressors, just curious.